September was a very good month for me as a Pez collector; this month's feature article details all of the great scores I got in the month. They can't all be as bountiful as this last month was, but then again you never know when it may happen again! I also get in on the "Batmanning" craze, and there's some Pez poetry and the Pez Almost-Quote of the Month as well. Lastly, be sure to check out the Pezhead Monthly Halloween page to for a one-stop shop of all Halloween-themed interviews, poetry, quotes, and much more! Thanks as always for reading, and see you next month. broughten on? Or something like that. At about that time, an employee passed by. I asked him if this was the only Pez they had in stock. He said that there were more around the corner, but not that much. As an added bonus, right after I found these dispensers, I ran into a fellow Pezhead (who also happens to be a local Pez dealer) who was looking for extras from this same new series. I was able to direct him to where I found the dispensers. He picked a bunch of them up- as many as could fit in his arms, actually- and I was somewhat proud that I was able to show him where they were (although I am sure that he would have found them on his own). Just over a week after this big score, I was in another part of town. I thought I'd swing by the area Walmart, because I had also heard about other new dispensers showing up there. Granted, it wasn't at the exact Walmart I went to (and usually, it can become quite the hunt as certain regions seem to get new Pez before others do), but I guess I was feeling lucky after finding Phineas and Ferb set. I looked in each checkout aisle, which is pretty much the only place where I find Pez at Walmart. In this case, I came up completely empty. Before heading back to the car, just for the heck of it, I asked an employee if there was any Pez that I may have missed. She didn't know, but she asked someone who did. He said that they didn't have a lot, but the only ones they had were back in the toy section. My goodness, I hadn't even considered that option! As with the Toys R Us experience a week before, the employee mentioned where the Pez was almost as an afterthought, but again it gave me just the amount of hope I needed. I briskly walked back to the toy section. And great news! Hanging on strips in a couple of the aisles were new Pez! 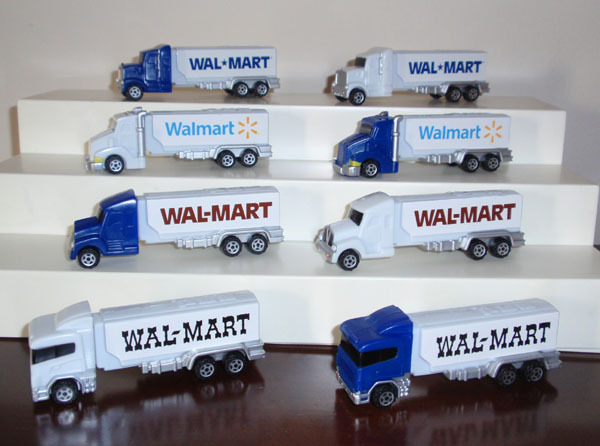 Specifically, these were new, limited edition Walmart trucks with 4 different logos from the company over the years. What's more, each truck has two different color heads (white and blue), meaning that there are 8 unique dispensers in this set. At that Walmart, I found 4 of these 8 haulers, which was both good and bad. 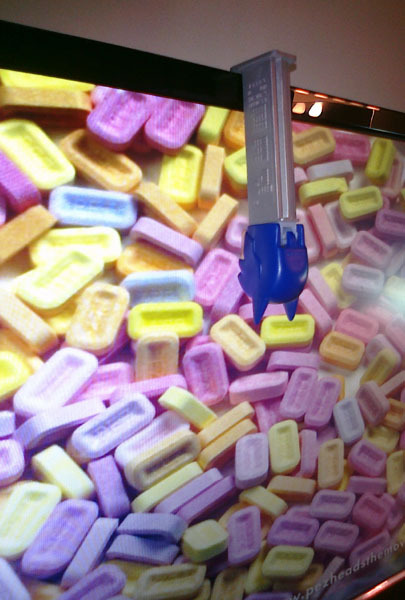 It was good because, hey, it's new Pez! Plus, I learned of a new location- in a store I already checked frequently, mind you- to hunt for Pez. On the other hand, from that point forward, I knew that every time I went to Walmart, I will instinctively check BOTH the checkout aisles and the toy section for new Pez. Even more so, now that these limited edition haulers have been spotted. True, this will double the possibility of finding new Pez, but it could also double the disappointment when I don't find any new Pez. Plus, who knows what other Pez scores may be found at Walmart toy sections down the road? After Phineas and Ferb and the Walmart haulers, I thought that my September could not get more Pezzerific. It turns out that I was wrong. Sometimes Pez shows up in unusual places. 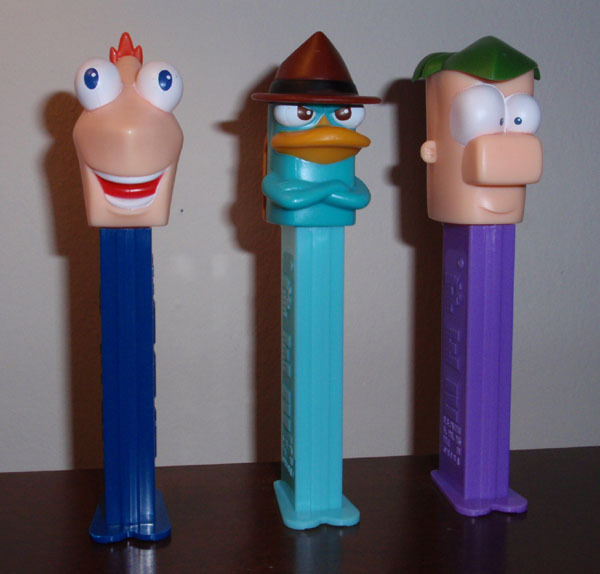 Case in point: earlier in the year, I learned that people were finding Pez in, of all places, hospital gift shops. I never would have thought to check there, plus I thought it would be a little odd to go to a hospital unless I or someone I knew was already, you know, in the hospital. But "a little odd" is just how I roll, so a couple of months ago I went to a local hospital gift shop and they had a good assortment of stuff, including collector sets and giant Pez. I picked up a giant Spider-Man and now it sits proudly atop my curio. A couple of weeks ago, fresh off of two great Pez scores, I decided to try for the hat trick and went back to that same hospital gift shop. And what did I find? Oh, not much. 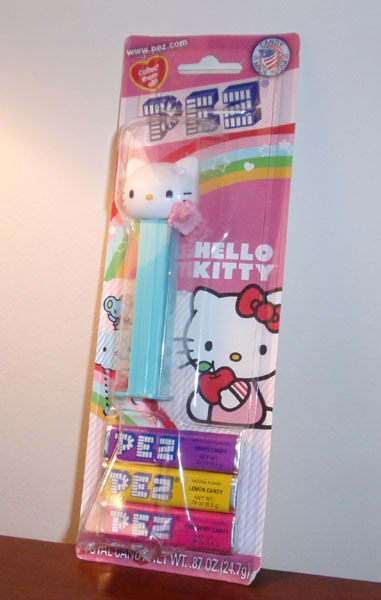 Just probably the biggest, coolest Pez set of the entire year. I proudly present the Lord of the Rings collector's series! Now, I will admit here that I am not a huge Lord of the Rings fan. But I also respect their place as a big part of pop culture (as well as geek culture), and I am very glad that many notable characters from the story are now immortalized on Pez dispensers. 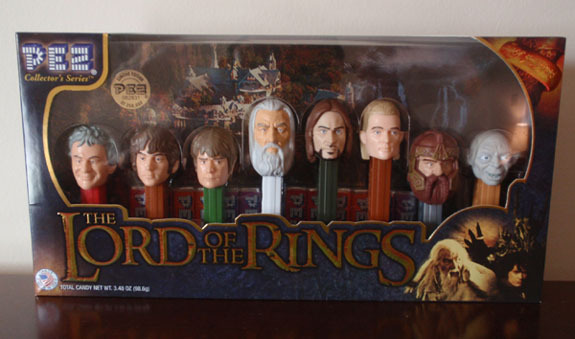 And, as with the Snow White set a few years back, the Lord of the Rings set contains a mixture of standard sized Pez dispenser and smaller sized ones- in this case, the smaller ones include four hobbits and Gollum. I am impressed with the overall design of the dispensers as well as the package, which contains summaries for each of the featured characters. So that hospital gift shop delivered in a big way last month, curing what ailed me. And oh yes, I will return there one day. It's a little weird to look forward to your next visit to the hospital, but there you go. Looking back on September, I am amazed at all of the new Pez I added to my collection: Phineas and Ferb, a factory error Hello Kitty, the Walmart trucks, and the Lord of the Rings collector set. Wow. I may not have another month as Pez-filled as that one until my next convention. But I can't complain, I can only keep on ridin' that Pez train to wherever it takes me next. "I'm not going to hurt you, Wendy. I'm just going to push your Pez candy out." For more Pez Almost-Quotes, click here. By now, you may have heard of the craze called "Batmanning." If not, here is a link to get you up to speed. Here at Pezhead Monthly, we felt inclined to get in on the fun too. So with that in mind, I present Batman Pez, Batmanning on my computer monitor. And last but not least, don't forget to visit Pezhead Monthly's special Halloween page, which contains links to plenty of spooky interviews, poems, and much more. 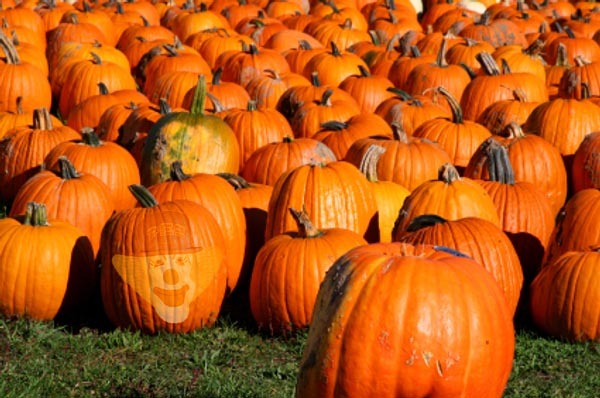 Check out the Pezhead Monthly Halloween page here, and happy trick-or-treating!